Arabian Ranches is the first golf course to be created by Ian Baker-Finch as a creative associate of Nicklaus Design, and is a desert course reminiscent of those found in Arizona or Palm Springs. Arabian Ranches is strictly a pay-as-you-play course, and this makes it superb value for the golf holiday-maker in Dubai. The two loops of nine reflect the natural character of the landscape as much as possible, which has been skillfully manipulated by former Open champion Baker-Finch to create some memorable holes. 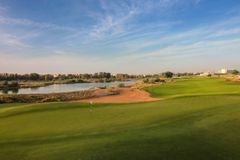 Pristine fairways and greens round off what is an outstanding holiday resort course, and one that makes for a superb round as part of a golf escape to Dubai. The Spanish Colonial style Clubhouse boasts the Ranches Restaurant and Bar, with a terrace overlooking the panoramic scenic views over the 9th and 18th holes - it's a great place to meet and there's a wonderful international menu. Within the Clubhouse there are 11 luxurious Guest Rooms which enjoy spectacular views over the golf course or the lake. Each en-suite room is beautifully furnished and comes with luxuries such as LCD satellite television, broadband internet, mini bar and ipod docking station. Step out of your room, hop onto your golf cart and drive straight to the first tee, totally refreshed for your game of golf. The perfect setting for any golfer. Difficult due to blind holes or obscure dog-legs. Difficult to determine value for money as individual pricing was not detailed in the package, Suffice to say we would not choose to re-visit this course. organisation was a bit lax as they did not have our reserved tee time in their system. They accepted it was their failure to put it on their system as they had the email from the agent. No problem though as the course was not busy. 2nd tier by Dubai standards but a friendly place and the course is certainly OK if not great. Tough course with lots of sand and tight fairways. Great course and greens were excellent.